And the right tools that make the job so much easier. 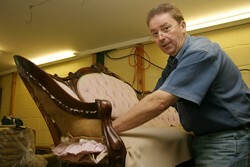 Ashburn Upholstery is happy to help with your upholstery project, whether you are a housewife, student or pensioner. Based on over forty year's experience of the trade I can not only offer sound professional advice, but should the item prove too daunting just leave the problem to Ashburn. 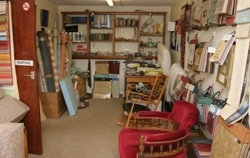 While we keep extensive stocks, and remnants, we can call on hundreds of fabrics and trimmings that can usually be ordered for you within a week or ten days. Please call and discuss your requirements. Shop hours are Monday to Friday, 8.30am till 1.00 . Saturdays are by appointment with parking outside the door. Bank transfers, cheques or cash welcome.